We would have completely missed Shelburne Falls, Massachusetts had we not been flower lovers. While driving through the Berkshires on State Highway 2, we saw a sign that read, “A Bridge of Flowers”. Intrigued, we turned off the highway and made our way to the little village. What a find! Shelburne Falls is on the Mohawk Trail, one of the oldest travel routes in America. It's actually composed of two villages on opposite sides of the Deerfield River — Shelburne and Buckland — that are linked by the famous “Bridge of Flowers”. Visiting downtown Shelburne is like driving into an 1800s time capsule. It includes unique art studios and galleries, staffed by resident potters and glassblowers, and other specialty shops. Shelburne Falls is equally proud of its “painted ladies”, lovingly restored grand Victorian-era homes. The Shelburne Historical Society and Museum and the Shelburne Falls Trolley Museum are also worth a look-see. One of the first things we did was grab a bite to eat at 10 Bridge Street, a restaurant reminiscent of the 1940s with its comfortable booths, slow-moving ceiling fans, '40s decor and tin ceilings. Appetites appeased, we walked a half block to the internationally known Bridge of Flowers. In 1929, this 400-foot-long trolley bridge, built in 1908, was transformed into a garden. Tended by the Shelburne Falls Womens Club, the bridge showcases more than 500 varieties of perennial and annual flowers, plants and vines. Because of the variety of flowers, the bridge “blooms” from early spring through the first frosts of autumn. You'll find a rose garden at one end of the bridge, along with a donation box and a guest book (more than 24,000 visitors signed last year). Next we followed the signs to Salmon Falls and its glacial potholes. Gyrating stones spun by whirlpools for thousands of years created the famous granite potholes, ranging in size from 6 inches to 39 feet in diameter–the world's largest pothole. Overall, we couldn't believe how much this little burg had to offer. Don't pass it by! Shelburne Falls is just south of State Highway 2, about a 30-mile drive northwest of Northhampton in northwestern Massachusetts. For more information call 1-413/625-2544. 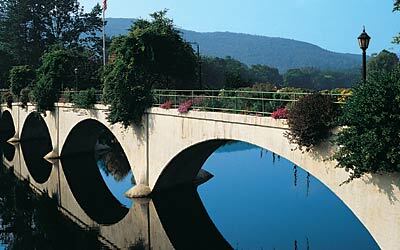 Franklin County offers an inviting blend of covered bridges, small towns and natural beauty. For details, call the Franklin County Chamber of Commerce at 1-413/773-5463.